Some patterns here are on a grand scale with sweeping, graceful lines, while others are equally impressive but in curious moments and refined personality. 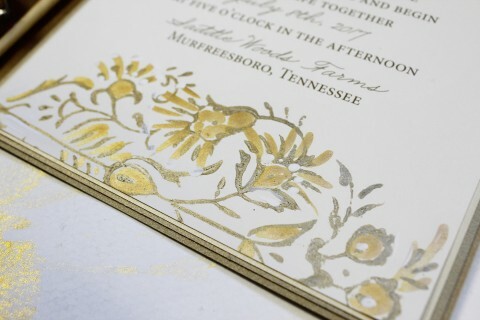 Artwork in this Paisley Patterns Wedding Invitation Collection is developed from a decades old wooden stamp leaving individual impressions on each invitation that instantly beguile the viewer. Texture can be felt and shimmery touches of color seen for a visual finish unlike any other. Paisley Patterns can enlighten a Bohemian inspired affair or perhaps even a more sophisticated celebration in classic golds and cream. What we love most about the impressions these carved wood stamps make into the paper, is that each impression, applied by hand with varying pressure produces a distinctive mark, if you will…as if each were made just for one viewer to enjoy. You may also enjoy this collection!